On the Aleutian Islands, an archipelago that extends southwest from Alaska, millions of crested and least auklets nest in the fractured terrain formed by lava flows. Here, the auklets’ nutrient-rich waste fertilizes the land, nurturing thick mats of grass. But as new research shows, the auklets’ ability to thrive depends on the land being periodically wiped clean by lava. If the landscape grows too lush, the birds lose their homes. But over the years, the auklet cacophony in the Aleutians has diminished. Research shows that once-massive colonies have shrunk in size, and that since the late 1800s, more than half a dozen colonies have disappeared. However, elsewhere in the birds’ Bering Sea range, north of the Aleutian Islands, researchers have noticed no such pattern. Renner delved into the mystery by closely examining the auklet breeding colonies where the fist-sized birds wriggle into natural crevices to lay their eggs. The fractured surface of a lava flow is one of the few landscapes that can hold enough crevices for a million birds. By looking for feathers and droppings, Renner mapped the edges of the colonies. She also examined the geology underlying the colonies and noticed that larger colonies were found on younger and more barren lava flows. In fact, the largest colonies in the Aleutians were all on lava flows less than 100 years old. The destructive nature of lava, it turns out, is the key to colony health. While auklets spend time nesting on land, their droppings accumulate around their crevices. Over time, this rich fertilizer encourages plant growth, and the auklets’ inviting homes are eventually transformed into impenetrable mats of sod. The island may become green and lush, but the barren-rock breeding habitat is gone. Until, that is, liquid hot lava erupts onto the landscape. 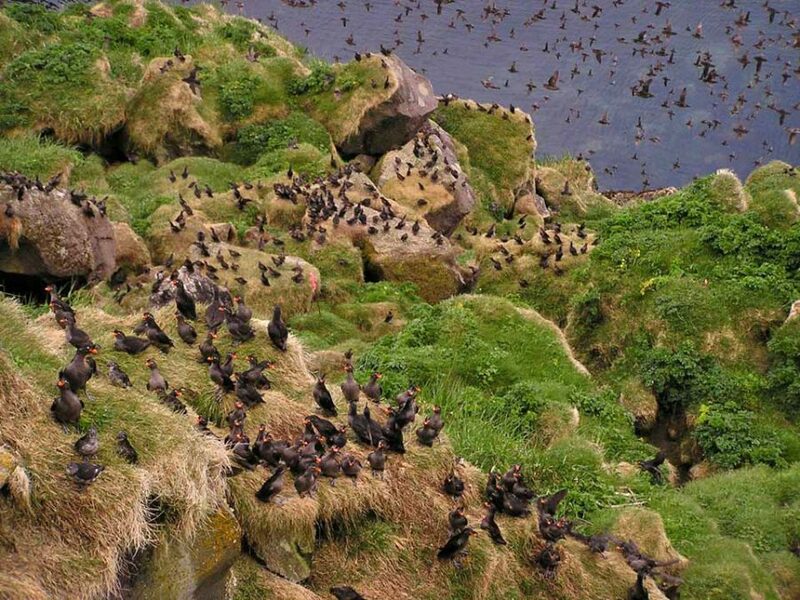 For the Aleutian auklets, it seems that shrinking colonies aren’t necessarily a sign of ecological catastrophe, but part of the birds’ natural cycle. Shrinking, Renner realized, is what auklet colonies always do. Over the long term, these declines are offset by the explosive growth of new colonies on fresh lava flows. The Aleutian Island of Kiska, for example, had one of the archipelago’s largest colonies in the 1940s. Over the years, as it became shaggy with grass, it hosted fewer and fewer auklets. Then in the 1960s, a fresh eruption sent a new tongue of lava snaking down next to the old one; the auklets flocked to this new home and flourished. Auklets are not immune to volcanic destruction. In 2008, when Kasatochi Island erupted during breeding season, tens of thousands of unfledged auklet chicks were entombed in the hot ash. But the adults survived, and 10 years after the eruption, the colony is barren rock and as productive as it was before. It was a catastrophe that ultimately assured the colony’s survival. For a species that thrives in a cycle of periodic destruction and renewal, an island exploding with fire can be good news. 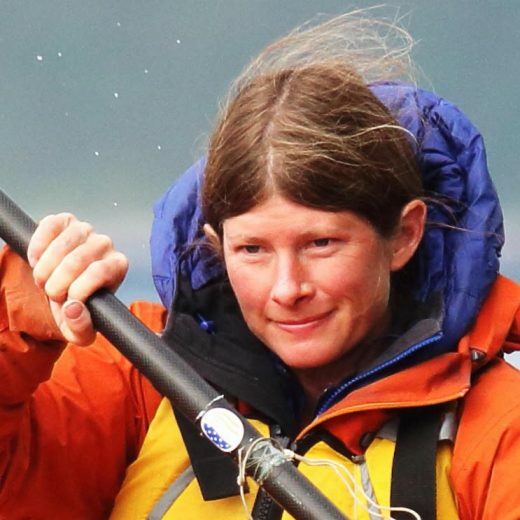 Cite this Article: Erin McKittrick “The Birds That Live with Lava,” Hakai Magazine, May 3, 2018, accessed April 25th, 2019, https://www.hakaimagazine.com/news/the-birds-that-live-with-lava/.